The Road Angel® ride bell came into existence when a friend of mine suggested that I put my new “AngelHeart” logo on a ride bell. That logo (Angel with a heart in the center) was originally to be featured in a line of clothing and jewelry for AngelHeart Designs. 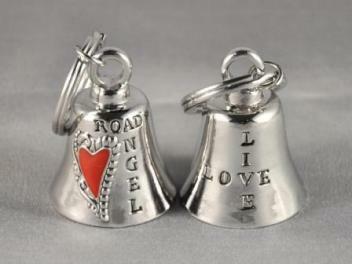 After a crash course in ride bells (I had never heard of them), and many trials and tribulations, the first Road Angel® ride bell was born in May of 2006. Our bells were different than most on the market at that time, because they were shiny like chrome, and featured colored enamel and crystals, and each one had a different message on the back. I began selling them to Harley-Davidson stores, one by one. We now have over 200 stores, including Hawaii and Scotland. Road Angel® is now a registered trademark of AngelHeart Designs. Our trademark was featured on a cami that was sold in Harley-Davidson stores in 2008 and 2009, and was a top seller. My friend, Kelly, joined me in 2007, and we quickly realized that we had stumbled upon a really FUN business! We began going to bike nights and sponsoring poker runs, etc. Then, of course, came riding lessons and buying the custom painted “Road Angel” motorcycle! Our mission now is to continue the fine quality of our products and to provide excellent customer service that is second to none. Our vision is to create a line of leathers, jewelry and accessories under the Road Angel® brand, and to partner with other women-owned businesses that promote each other and the greater good.